Every day you wake up, go to work and spend the whole day moving up and about or sitting in the office. By the end of the day your body feels stiff and your muscles ache. You need a massage which has numerous health benefits, like making you feel relaxed, improving blood circulation, relieving stress, boosting immunity, etc. So how to give a relaxing body massage? The body and mind need a calm and clean environment in order to relax. 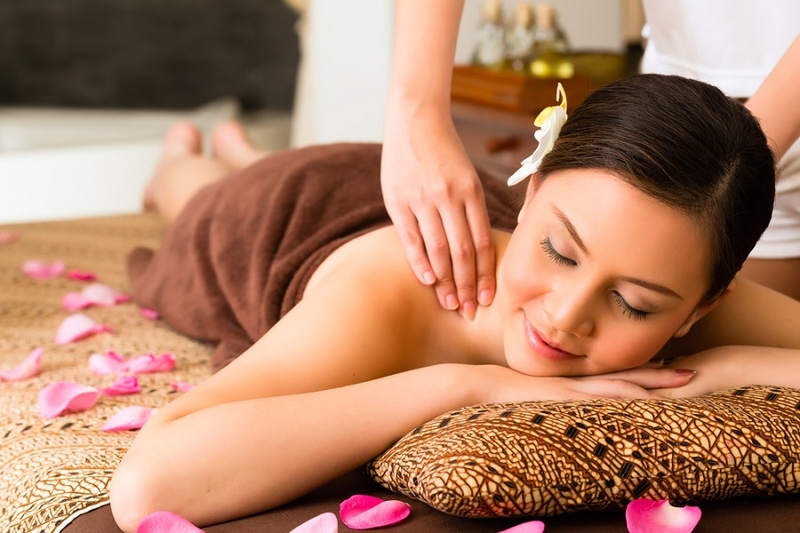 Create a serene atmosphere that is comfortable for the massage session. Ensure that the place is quiet and free from noise and clatter. Find a flat surface like a table, sofa or bed to perform the massage. Ensure that the room is private and keep clean towels and bathrobes for changing. If the air in the room is too cold, heat it up; if it is stuffy, freshen it up. Candles have a therapeutic role when used in a massage session. These are not ordinary candles, but special candles. They are scented to release fresh herbal scents that clear the nose and relieve the mind. Avoid using strong scents which will only leave the air congested instead of refreshed. Besides, candle light dims the room, giving it a relaxed ambience that sends the mind to sleep. Music has the power to transform the state of mind. Play soft or classical music or sounds from nature to soothe your soul and make you relax even more when giving a full body massage. Or you can find the type of music your partner like to calm him or her down. Make the music gently played in the background and don't make it too loud which will only break the needed serene atmosphere. A massage room needs a lot of fresh, clean towels. You need towels to cover the surface your partner is going to lie on, cover your partner to keep warm and cover his or her private parts to avoid embarrassment. Towels of all kinds of sizes are needed. Small towels can be used to wipe off the excess massage oil from the body or hands, while medium and large sized ones serve as surface or body covers. Use towels with cool and clean colors like white, cream, green and pink -- depending on your choice. Begin the massage from the lower parts of the body and work your way upwards. Start with one leg, massage the ankle and move towards the thigh, concentrating on areas with painful muscles. Use smooth strokes and continue upwards. Compress the tight muscle areas. Repeat the process for the other leg. If you are doing this to a client, make sure you ask him or her before massaging the leg since some people are very ticklish and might not take it easily or kindly. For this part of a full body massage, use slow circular movements with your palms to massage the back area. Focus on the two sides of the backbone making sure to balance the movements. Repeat the movements using your fingertips and knuckles. Add more massage oil and use your elbows and wrists to encircle the muscle areas. While at it, use different motions or techniques such as kneading the body, compression and shaking the muscle area. Once this is done, make smooth strokes along the back from the lower to the upper areas to finish it. In a face up or face down position, use movements similar to those used in the leg massage to stroke the arms. Apply massage oils along the arms and hands. Use circular motions and compression to do the massage. Use your fingertips to press on hard tensed areas, and massage along the muscles of the arms. Repeat the smooth strokes until the muscle feels relaxed, and then move to the other arm. As for hands, pull the fingers softly and release, and give small circular frictions to the palm with your thumb. In a flat position, allow your partner or client to lie with the head facing down. Massage the neck area and the neck joint. Press your fingers around the neck support area connecting to the shoulders. Massage the shoulders placing your fingers in a long wide position. Move to the collarbone and shoulders. Work along the joints and move up towards the head. Massage gently when you come to the corner of the scalp where pressure points are located. Move to the face muscles to finish with the sides of the head. When massaging the face, have your partner or client lie in a face-up position. Focus on the focal points which are the jawlines, temples and cheekbones. Massage with light pressure and in circular motions. Use your thumbs to massage the sides of the head and the rest of the fingers for the forehead. As your hand moves in circles, it creates smooth friction along the important muscle points. The feet massage is really relaxing, so crown the full body massage with this soothing and calming massage. Making feet the last part to massage also helps avoid spreading bacteria on feet to other body parts. Use soft strokes to massage from the ankle areas to the top of the feet and to the toes. Pull each toe softly and apply soft pressure on the heel. Identify the pressure points on feet and apply light pressure on them. Make circular strokes along these points and release. Server responsed at: 04/23/2019 8:15 p.m.